We all go to those pot-luck dinners at church or with your garden clubs and you’re asked to bring a dish to share with the group. Right? And you want yours to be one of the dishes that everyone loves, it all gets eaten, and everyone wants the recipe. This one works for me every the time. In fact, they ask me to bring it! 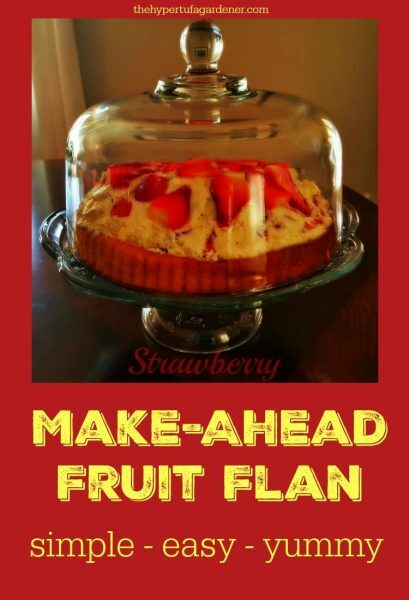 Strawberries are available any season now, so it is the perfect time to make this Strawberry Make-Ahead Fruit Flan. But you can make this flan-style cake with any fruit you like or any in season. My husband loves the blueberry version. 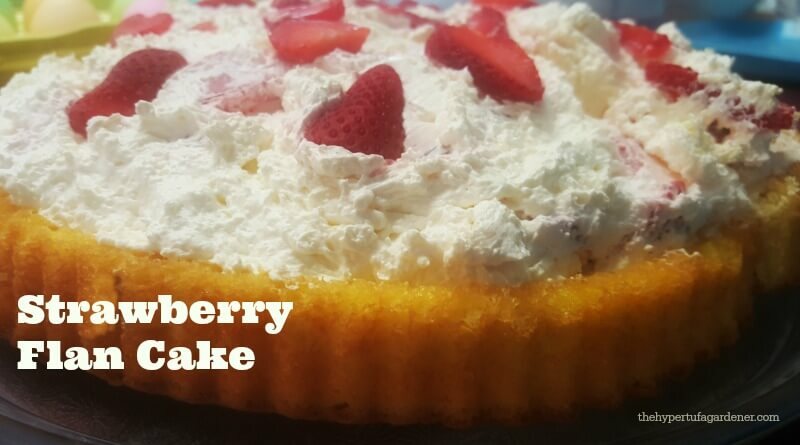 The blueberries go well with cream cheese and Cool Whip, so just make whatever you want! Make it for Christmas with some sliced kiwis along with strawberries. So festive! Fruit Flan is beautiful at Fourth of July holiday picnics made with BOTH strawberries and blueberries! I feel the lemon cake mix adds a zing to the recipe, but you can use yellow cake mix if you prefer. Before I retired, I used to take this to the office when we had a “carry-in day” or any celebration of any kind. It was easy to throw together the night before. One box of cake mix makes two of the flans, and since they need to be baked and cooled prior to putting it together, it can bake and then cool while you get things done after work or as you fix some supper. 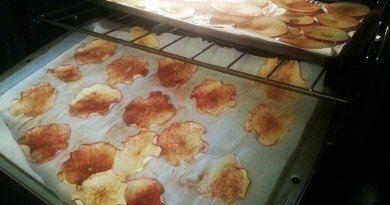 And don’t forget to use your parchment paper to line the pans. Just cut it into a circle (unless you get some that already comes that way?) The flan cake is so much easier to remove when you are sure to cut a circle out of parchment paper and line the “well” of the baking pan. 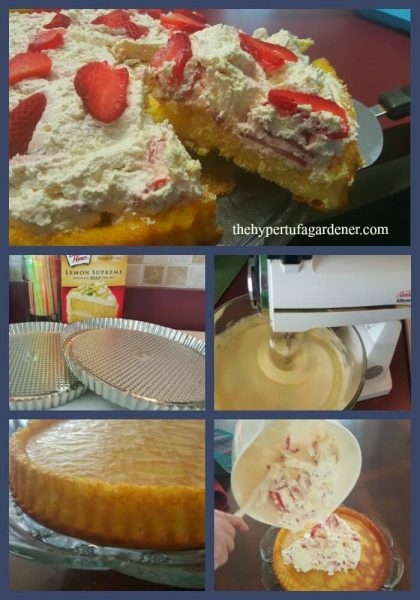 Quick and Easy recipe for a fruit flan cake. 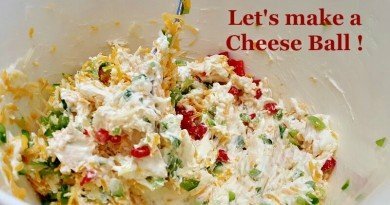 Make ahead and it is chilled and ready to take to the party or eat. Mix Duncan Hines cake according to directions. One box will make 2 flans. 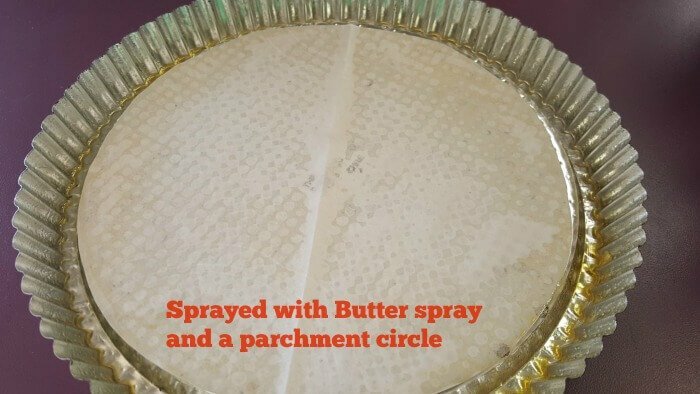 Spray tins with butter Pam spray and line with a parchment paper circle. Pour half batter into each tin and bake. Cool cakes for 10 mins, then remove to your cake plates. Mix all Cool Whip with both blocks cream cheese, lemon juice, and honey. Pour half of this mixture into each flan "well" and smooth. It will be deep! You can slice strawberries and arrange on top as decoration. Chill covered in fridge, overnight is fine. Or slice and dig in now! 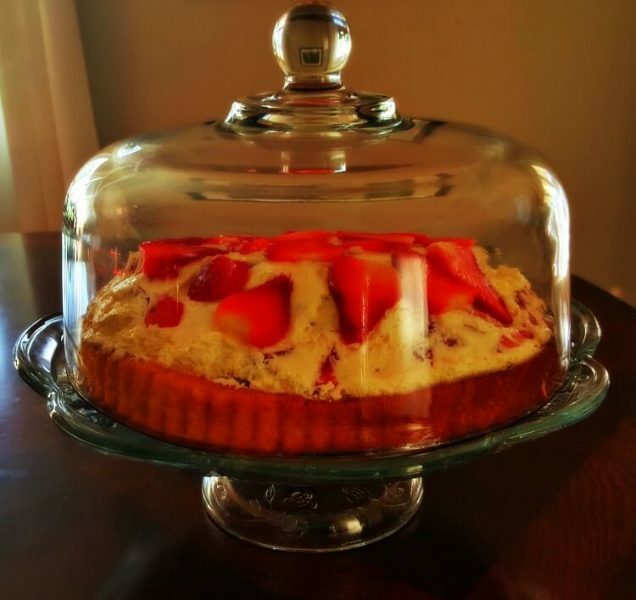 I have two cake domes as in photo to store mine. Transports fine. ← What Are These Shrubs and Trees In My New Garden?